Newry and Mourne Ancestry is a free online resource for those wishing to discover more about their family history in the Newry and Mourne District Council area. 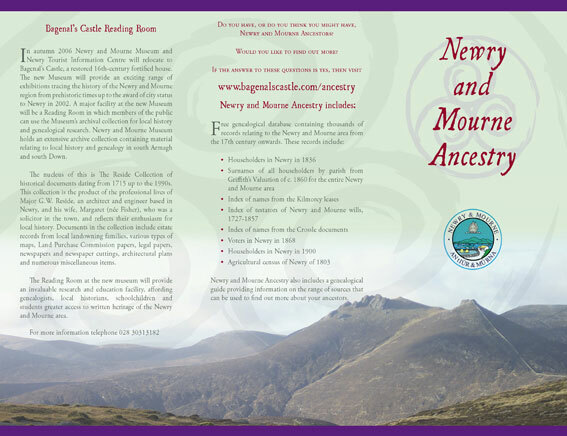 In 2005 the Ulster Historical Foundation was commissioned to compile a database of records for this website as well as a guide to carrying out family history research in Newry and Mourne. The records digitised included the Householders Index to the area, 1803 agricultural census for Newry parish, deeds and other documents from the Kilmorey and Crossle collections in the Public Record Office of Northern Ireland, Newry and Mourne wills, 1727–1858, and names for Newry from the 1900 Belfast and Province of Ulster Street Directory. Over 14,000 individual names were indexed as part of the project. The Ulster Historical Foundation was subsequently asked to produce a promotional leaflet advertising the website and online database. In autumn 2006 Newry and Mourne Museum and Newry Tourist Information Centre will relocate to Bagenal’s Castle, a restored 16th-century fortified house. A major facility at the new Museum will be a Reading Room in which members of the public can use the Museum’s archival collection for local history and genealogical research. Newry and Mourne Museum holds an extensive archive collection containing material relating to local history and genealogy in south Armagh and south Down. The Reading Room at the new museum will provide an invaluable research and education facility, affording genealogists, local historians, schoolchildren and students greater access to written heritage of the Newry and Mourne area.